Ilham, et al. Use of Organic Selenium Supplements in Soybean Meal-Based Diets for Juvenile Yellowtail Kingfish (Seriola lalandi). (2016) Int J Food Nutr Sci 3(1): 218-228. © 2016 Ilham. This is an Open access article distributed under the terms of Creative Commons Attribution 4.0 International License. Sustainable aquaculture, from both ecological and economic perspectives, demands a substantial reduction of the amount of fishmeal used in aqua feed. Instead, plant-derived protein feed stuff, which provide a nutritious diet offer a promising alternative for inclusion in aqua feed. In this study, the effects of organic selenium supplementation in low and high soybean meal-based practical diets for yellowtail kingfish (Seriola lalandi) were evaluated over a 60-day feeding experiment. The juvenile yellowtail kingfish (initial weight 5.02 ± 0.04 g fish−1) were fed five iso-nitrogenous and iso-caloric diets containing 49% crude protein and 22 MJ kg−1 gross energy. The control diet(C) includes 46% fishmeal, whereas the other diets used soybean meal to replace 25% and 75% of the fishmeal protein, both without and with organic selenium supplementation (SBM25, SBM25+Se, SBM75, and SBM75+Se). Fish were fed ad libitum two times a day at 09:00 and 15:00 hours. No differences were observed in feed intake among dietary treatment groups (P > 0.05). Organic selenium-supplemented diets improved final weight; however, final weight was significantly reduced when fish were fed high soybean meal diets (P < 0.05). Organic selenium supplementation had a significant effect on specific growth rate at low soybean meal diets, but did not affect specific growth rate when fish were fed high soybean meal diets. Selenium accumulation in fish fillet was strongly correlated with selenium concentration in the diets. While fish fed the SBM25+Se diets had significantly higher glutathione peroxidase activity than those fed other diets, the lowest glutathione peroxidase activity was found in fish fed SBM75 diets. Histologically, selenium-deficient diets induced myopathy and alterations in tissue structure were most prevalent in fish fed the SBM75 diet. The findings of this study indicate that, with Se supplementation, soybean meal could supply 25% of the protein in yellowtail kingfish diets. One of the major challenges facing the aquaculture sector worldwide is the limited utility of formulated feed containing fishmeal (FM) from wild sources. Soybean meal (SBM) is among the most attractive plant protein (PP) substitutes for FM due to its satisfactory protein and amino acid content, wide availability, and reasonable price. The partial or full substitution of SBM for FM in finfish diets has been studied over the past two decades[3-12]. These studies have revealed that various levels of SBM are acceptable for inclusion in place of FM in terms of both the nutrient composition of SBM diets and performances of the fish studied. However, one major drawback to the utilisation of PP ingredients in this context is the presence of certain antinutritional factors (ANFs):innate substances that can impair utilisation and digestion of nutrients. Phytic acid is one of the most common ANFs in PP feed stuffs, since around 56 - 81% of total phosphorus (P) in SBM is stored asphyxiate. This phytic acid-bound P cannot be hydrolysed by monogastric animals, including fish. Moreover, phytate chelates divalent mineral cations such as Iron (Fe), Zinc (Zn), Magnesium (Mg), Manganese (Mn), Copper (Cu), Calcium (Ca) and Selenium (Se), thus limiting availability of P and other minerals in SBM-based diets[13,16]. Phytate may also form insoluble complexes with protein and amino acid (AA) cations in PP feedstuffs, diminishing their digestibility for fish. Consequently, supplementation of trace minerals has been applied to the diets of several fish species to improve mineral bioavailability[18-20]. Se supplementationhas been reported to beneficially affect the performance of various fish species. Although the element is only required in trace amounts, Se is an essential nutrient for aquatic organisms due to being an integral component of selenocysteine (SeCys)-containing proteins, which are involved in most aspects of cell biochemistry and functioning. Moreover, Se is employed in the antioxidant enzyme glutathione peroxidase (GPx)[22-24], which, in fish, may provide protection against oxidative stress following exposure to physical and environmental stressors. Se is also associated with protein in the muscle tissues of marine animals. Fish may absorb minerals directly from the surrounding water, but diet is their major source of Se. The varying Se requirements and toxicity levels for fish on a FM-based diet have been documented[28-33] these differences may depend on the concentration and type of compound absorbed, the duration and mode of exposure, and fish species in question. However, research is still required into the nutritional implications of Se-deficient, PP-based diet on fish growth and physiology, as this could be used to inform further dietary modifications for cultured fish. This work is of particular interest in relation to emerging aquaculture species, such as yellowtail kingfish (YTK, Serio lalalandi). Although several studies have investigated YTK nutrition[34-38], no previous work has examined the relationship between Se-enriched SBM diets and the growth and health of the species. YTK may, due to the presence of certain ANFs, have a relatively high requirement for the antioxidant properties of Se. Therefore, the present study was designed to determine the growth and physiological performance of YTK when fed Se-supplemented, SBM-based diets. The study achieved this goal by exposing juvenile YTK to low and high levels of dietary SBM inclusion, with and without Se supplementation, for 60 days and then evaluating survival and growth performance, GPx activity and muscle histopathology. The formulation and proximate content of the diets are shown in (Table 1). All ingredients were ground to pass through a 1-mm mesh screen, pelleted in a mixer, crumbled to the desired size, air-dried, and stored at 4°C until feeding. Five diets were formulated: 0% SBM (SBM0, control), low SBM(25%) without and with organic Se (OS) supplements (SBM25; SBM25+Se), and high SBM(75%) without and with OS supplements (SBM75; SBM75+Se). All experimental diets were prepared to be iso-nitrogenous (49% crude protein) and isoenergetic(22 MJ kg−1 gross energy) basis. Chromic oxide (Cr2O3) was included in all diets at 0.5% as an inert, indigestible marker. The Se dosage for dietary supplementation was based on our preliminary study and similar to the recommendation of Le and Fotedar for the optimal growth of YTK. 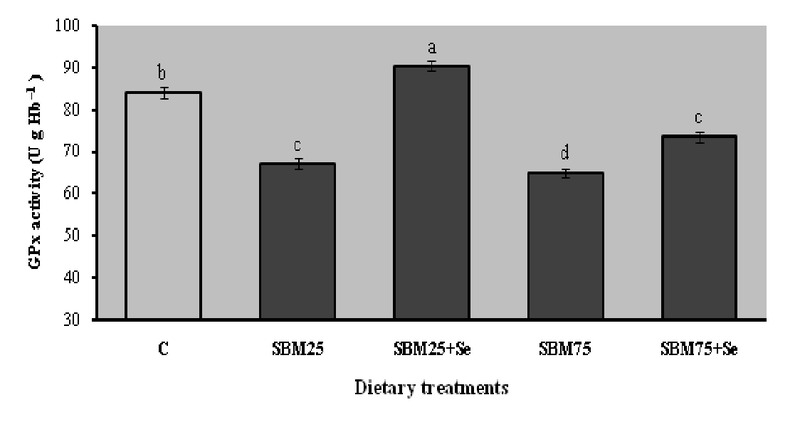 The Se concentrations in C, SBM25, SBM25+Se, SBM75 and SBM75+Se diets were 5.53, 2.59, 5.54, 1.56, and 5.53 mg kg–1 respectively. Amino acid (AA) profiles of the experimental diets are shown in Table 2.
aSupplied by Specialty Feeds, Perth, WA, Australia, except for Sel-Plex and chromic oxide, obtained from All Tech, Lexington, Kentucky, USA and Thermo Fisher Scientific, Scoresby, Vic, Australia, respectively. cContains the following (as g kg–1 of premix): iron, 10; copper, 1.5; iodine, 0.15; manganese, 9.5; zinc, 25; vitamin A retinol, 100 IU; vitamin D3, 100 IU; vitamin E, 6.25; vitamin K, 1.6; vitamin B1, 1; vitamin B2, 2.5; niacin, 20; vitamin B6, 1.5; calcium, 5.5; biotin, 0.1; folic acid, 0.4; inositol, 60; vitamin B12, 0.002; choline, 150; ethoxyquin, 0.125. Table 2: Hydrolysed amino acid composition of FM, SBM, wheat gluten and casein (g 100 g–1 protein). Juvenile YTK (mean weight 4.85 g) were obtained from the Australian Centre for Applied Aquaculture Research, Fremantle, Western Australia (WA), Australia. Fish were fed with a commercial diet (Gemma Diamond 1.5, Skretting, France) for one week until fully acclimated to the rearing conditions. Fish were then randomly sorted into 15 experimental tanks, with three tanks of 15 fish each for each diet. Fish handling procedures, care standards, and facilities all complied with the guidelines of the Animal Ethics Committee of Curtin University and followed the Australian Code of Practice for the care and use of animals for scientific purposes. The experimental system consisted of 15 circular, 300-L fibreglass tanks installed at the Curtin Aquatic Research Laboratory (CARL), Curtin University, Australia. Each tank received re-circulated water from an external biofilter (Fluval 406, Hagen, Italy) at 10 L min–1. 50% of the water was exchanged twice weekly. All experimental tanks were supplied with constant aeration and pure oxygen (compressed oxygen, BOC, Perth, WA, Australia). Throughout the experiment, the water quality parameters were monitored daily. Dissolved oxygen (DO) was monitored using a DO meter (CyberScan DO 300, Eutech Instruments, Singapore). Ammonia and pH were measured every two days using chemical test kits (Aquarium Pharmaceuticals Ltd, UK) and a pH meter (CyberScan pH 300, Eutech Instruments, Singapore) respectively. Water salinity was measured using a portable refractometer (RHS-10ATC). The photoperiod consisted of 12 hours of fluorescent light per day. Fish were hand-fed to satiation twice a day, at 09:00 and 15:00 hours. To investigate the effect of dietary treatment on digestibility, one week before the end of the feeding experiment faecal matter was collected immediately prior to the morning feeding using stripping techniques. Faecal collections from individuals were pooled by tank and quickly stored at -20°C. Prior to analysis, the faecal samples were dried to constant weight at 105°C. Apparent digestibility coefficients (ADCs) were measured using the indirect method (Cr2O3) as suggested by Choet al. Fish weight sampling was conducted at the beginning of the feeding trial and at 15-day intervals thereafter. At the end of the feeding trial, all fish were starved for 24 hours prior to final sampling to achieve a basic metabolite state. The fish were then anaesthetised with tricaine methanesulfonate (MS-222, Sigma-Aldrich, Castle Hill, NSW, Australia) at 100 mg L–1 before sampling. Fish blood samples were drawn by caudal vein puncture with a 1-mL plastic syringe. The extracted blood was then transferred to K2EDTA-containing tubes (BD Vacutainer® Plus Plastic) for haematology. An Hb kit (Randox Laboratories, Antrim, United Kingdom) was used to measure the haemoglobin (Hb) content. Erythrocyte (red blood cell) glutathione peroxidase (GPx) activity was quantitatively assayed using the Randox Laboratories combined test (Ransel, Antrim, United Kingdom). Enzyme activity is expressed in U g Hb−1. The proximal compositions of the diet and faecal samples were determined based on Association of Official Analytical Chemists procedures. Dry matter was determined by oven drying to constant weight at 105°C crude ash by combustion at 550°C crude protein content (N × 6.25) by the Kjeldahl digestion method crude lipid content by the Soxhlet technique; and gross energy content by an IKA oxygen bomb calorimeter (Heitersheim, Germany). Se in the muscle tissue and experimental diets was analysed at the Intertek Genalysis Laboratory (Perth, Australia) using inductively coupled plasma-mass spectrometry instrument (ICP-MS, 7500 series, Agilent Technologies, Australia). At the end of the trial, tissue samples from five fish from each tank were collected, fixed in 4% saline and formalin, then dehydrated in ethanol before equilibration in xylene and embedded in paraffin wax. Sections of approximately five μm were cut and stained with haematoxylin and eosin for histological examination under an Olympus BX40F4 light microscope. Light microscopy samples were prepared according to standard histological techniques. Where: SGR (specific growth rate), FW (final weight), IW (initial weight), WG (weight gain), FI (feed intake), FCR (feed conversion ratio), S (survival), ADC (apparent digestibility coefficient). The results were analysed using one-way analysis of variance (IBM SPSS Statistics, Australia). When appropriate, a posthoc test (utilising the Duncan method) was applied to examine differences among the treatment groups, with a probability value of P < 0.05 indicating significant differences. The relationship between Se concentration and fillet Se content was evaluated using regression analysis. All data are expressed as means of three replicates ± standard error (SE). Data expressed as percentages were arcsine transformed prior to statistical analysis. Although the FI values of fish fed high SBM diets were lower, they did not differ significantly from those fed on the control or low SBM diets, ranging from 1.36 to 1.52 g fish–1 day–1. All experimental diets were accepted by the fish throughout the course of the feeding trial. Figures for fish growth performance, survival, FI and FCR are presented in (Table 3). The FW of fish fed low SBM diets did not differ significantly from that of fish fed the control diet (P > 0.05), though FW was significantly reduced when fish were fed high SBM diets (P < 0.05). However, OS supplementation improved FW for both low and high concentrations of SBM protein in diets. Although OS supplementation had no effect on SGR for low SBM diets, it did when fish were fed high SBM diets and the SGR of fish fed the SBM75+Se diet was significantly higher than that of fish fed the SBM25 diet. In addition, an improved FCR was observed in fish fed with OS-supplemented diets, although no difference in SGR was found between the SBM75 and SBM75+Se dietary groups. The changes in the mean body weight of juvenile YTK during the experimental period are presented in (Figure 1). All groups of fish had similar body weights during the first two weeks of the trial, after which growth deterioration began in fish fed high SBM diets. High survival rates, exceeding 95%, were found for all dietary treatments during the experiment. Table 3: Growth performance, survival, FI, and FCR in juvenile YTK fed the test diets for 60 days. Data are expressed as means ± S.E. Means in the same row with different superscript letters are significantly different (P < 0.05). The proximate composition, gross energy and Se concentration of fillets from YTK fed experimental diets are displayed in (Table 4). At the end of the feeding trial, crude lipid, ash, moisture and gross energy content did not differ significantly between dietary treatments (P > 0.05). However, crude protein in fillet was significantly reduced with the increase of SBM as a proportion of the diets (P < 0.05), while fish fed diets supplemented with OS accumulated more Se in their fillets than those fed on other diets (P < 0.05). 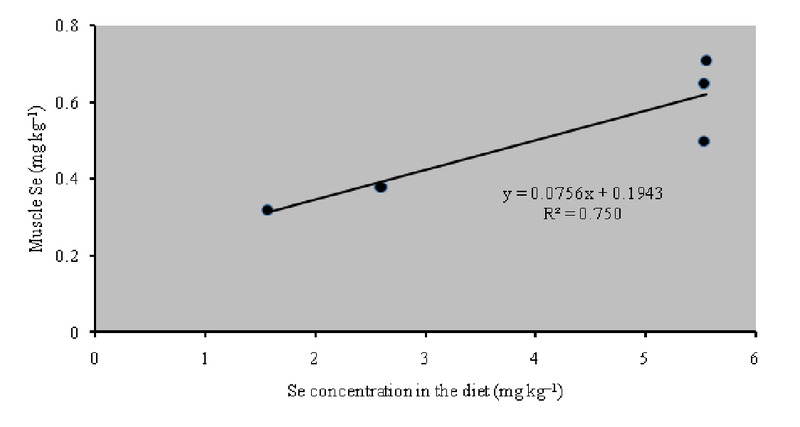 A linear relationship was observed between fillet Se content and dietary Se supplementation (Figure 2). Table 4: Proximate composition, gross energy, and Se concentration of fillets from YTK fed experimental diets. (Table 5) presents the data for apparent digestibility coefficients (ADCs) of protein, lipid and dry matter. ADC of protein and dry matter was not affected by OS supplementation, but was influenced by SBM levels. Furthermore, while dietary replacement of FM protein with SBM at moderate (25%) or substantial (75%) levels resulted in insignificant ADC scores for lipids, the ADC of proteins and dry matter was significantly reduced as the proportion of SBM in the diets increased. Table 5: Apparent digestibility coefficients (ADC, %) of the nutrients in the five experimental diets. The GPx activity in the red blood cells (RBC) of YTK for each dietary treatment is summarised in (Figure 3). GPx activity tended to decrease with decreasing levels of Se in the diets. The fish fed SBM25+Se had a higher GPx activity (P < 0.05) than with those fed other diets. The lowest GPx activity was observed in fish fed the SBM75 diets. The histological profiles of the fish tissue samples from the control, SBM25, SBM25+Se, SBM75, and SBM75+Se groups are shown in (Figure 4). Tissue samples from fish fed the different dietary treatments were compared to those from fish fed the control diet, with several histopathological alterations evident in those fed diets without OS supplementation. 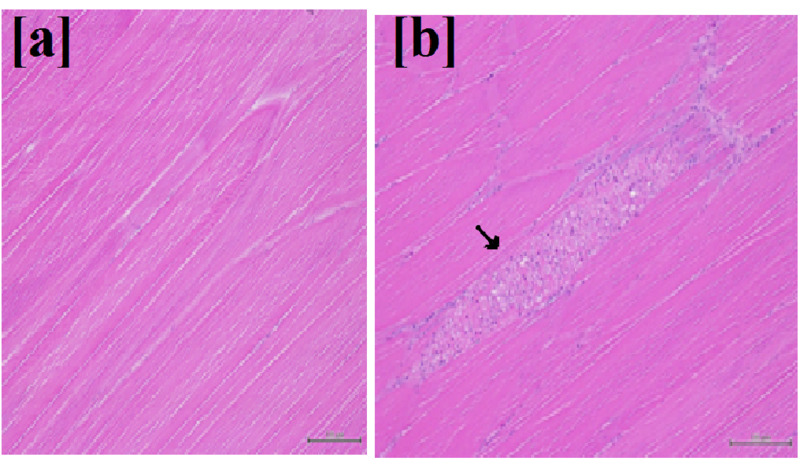 These pathological findings included the deterioration of muscle bundles, with the aggregation of inflammatory cells between bundles and necrotic changes. The alterations were most prevalent in fish fed the SBM75 diet, with four of five samples exhibiting such changes. Following the recognition of Se as an essential element in aquaculture feeds, numerous formulations have been supplemented with this chemical to enhance diet quality. However, no published information was available regarding Se supplementation in carnivorous marine finfish fed on SBM-based diets. In the present study, OS supplementation was found to contribute to fish performance, as OS-supplemented diets significantly enhanced the FW, SGR and FCR of fish compared to those fed the same diets without OS supplementation. This finding agrees with the results of previous FM-based studies employing both similar[37,44] and different species[28,30-32,45-48]. The present study suggests that Se supplementation is necessary to ensure growth performance of YTK when FM protein in their diets was moderately or substantially replaced with PP ingredients. The effects on fish performance of increased OS supplementation in high SBM diets should be further investigated. However, the biological availability of Se from FM appeared to be low, possibly due to the binding of Se to mercury and other heavy metals. Therefore, Se supplementation in FM-based diets is required to encourage optimal growth, avoid deficiency syndromes and enhance the functional immune system in YTK. Additionally, YTK aquaculture is intended to produce fish fillets for human consumption; thus, it is of considerable interest whether raw feed ingredients can be satisfactorily converted into edible, nutritionally complete fish fillets. Muscle, kidney and liver tissues are known to store Se in the form of selenomethionine (SeMet) and a linear relationship has been observed between tissue Se and supplemental Se dosage in hybrid striped bass. However, Se storage capacity is higher in liver and kidney tissues than in muscle tissue[29,51]. In addition, different forms of Se are accumulated in tissues at different levels, with SeMet (organic) retained more than selenite (inorganic)[44,48,52,53]. In this study, Se from a commercial product (Sel-Plex®) containing organically bound Se in the form of SeMet was utilised as the feed supplement. The findings showed that fish fed on diets with supplemental Se retained Se in their muscles nearly twice as effectively as those that did not receive the Se supplement. This is consistent with the results of previous studies using similar species[38,54], although slightly higher Se accumulation was observed in the present study, which reflects the high absorption rate of SBM diets containing SeMet. Moreover, as SeMet is incorporated into proteins in the muscle tissue of marine animals, increased accumulation of Se in fish muscles is to be expected. The major biological form of Se is selenocysteine (SeCys). SeCys is synthesised and specifically incorporated into proteins through a complex process. Through the Se labelling of mammals in vivo or cells in culture, approximately 30 – 40 selenoproteins have been detected, of which 15 have been purified to enable characterisation of their biological functions. GPx enzymes, a major group of functionally important SeCys proteins, play an antioxidant role, protecting cells and membranes from the harmful oxidative damage from hydrogen or lipid peroxides. Rotruck et al., moreover, found Se to be an integral structural element of the active core of GPx enzymes in RBCs; these proteins have since been extensively used to measure Se nutritional status. In the present study, the change of GPx values in response to Se supplementation shows that the Se requirements of YTK were not met by the control diet. Se-dependant GPx activity was significantly higher in the RBCs of fish whose diet was supplemented with Se than in the RBCs of fish fed Se-deficient diets. This result clearly indicates that SBM without Se supplementation provided inadequate Se for maximal GPx activity and thus did not meet YTK Se requirements during the juvenile raising period. The dietary Se requirement of YTK is estimated to be around 5.56 mg kg–1, which supportsthe results of the present study. Similarly, in other species, GPx activity is significantly increased with increased dietary Se intake[32,61] and significantly decreased with diets deficient in Se[31,62-64]. Additionally, the GPx levels revealed that Se requirements may increase as a result of handling and confinement stress, such that Se-deficient diets may not meet the increased Se requirements. The effect of Se on the growth performance of YTK in the present study may be due to the antioxidant role of GPx. However, feeding a high-SBM diet supplemented with Se to juvenile YTK did not increase GPx activity to the maximum level, although GPx activity was significantly higher in the SBM75+Se group than in the SBM75 group. This result may be due to anti-nutritional phytate interfering with the normal absorption of Se. Commonly used plant-derived fish feed ingredients such as SBM contain 10 – 15 g kg–1 phytate. Phytate chelates with di- and trivalent mineral cations, such as Cu, Zn, Co, Mn, Fe, Se, Mg and Ca, consequently forming insoluble complexes in the upper gastrointestinal tract, where maximum mineral absorption typically occurs. Several authors have reported reduced levels of minerals such as Ca and Zn in the plasma of common carp due to high phytate (≥ 1%) diets[66,67]. Phytate content was not measured in the present study, so the extent to which phytate impacted the absorption of Se and its antioxidant activity in YTK cannot be stated precisely. The structure and function of cell membranes is strongly correlated with GPx activity[68,69]. Presumably, therefore, marine animals with lowered antioxidant activity are more prone to cell damage and decreased oxidation resistance due to reduced Se may profoundly alter the cell membrane structure of fish. For example, previous work with Atlantic salmon(Salmo salar) has shown that histological Se deficiency lesions result from inadequate protection against the peroxidation of organelle membrane lipids. In addition, Wang et al. report that low dietary Se content aggravates tissue peroxidation and causes acute cell damage in common carp (Cyprinus carpio), as shown histopathologically by degeneration and necrosis in the organelles, cells and tissues (including muscle tissue). Similarly, evidence establishing an association between Se and muscle abnormality was obtained in the present study, as nutritional myopathies and necrosis were observed in the muscle tissue of juvenile YTK fed Se-deficient SBM diets. Most importantly, the findings in the present study suggest that the reduced GPx activity of SBM diets lacking Se supplements, indicative of low cellular Se status, was connected to muscular dystrophy. However, this result must be validated either by using other plant-derived ingredients or by investigating other carnivorous marine finfish species. Furthermore, a recent study by Bowyer et al. reported that solvent-extracted SBM could replace 10% of FM protein in YTK feed. With similar species, Bowyer et al. also found that soy protein concentrate (SPC), a highly refined soybean product, was a suitable replacement for FM at a 20% inclusion level. However, it should be noted that no Se supplementation was conducted in those studies. When feed supplementation is discounted from diet evaluation, the appropriate inclusion level of SBM varies widely. For instance, while Silva-Carrillo et al. reported significant growth deterioration when replacing 20% of FM with SBM in the diet of juvenile spotted rose snapper (Lutjanus guttatus), studies have demonstrated that SBM protein can replace from 20% to 30% of FM in the diets of other finfish species, including Mediterranean yellowtail (Seriola dumerili), gilthead sea bream(Sparus aurata), cobia (Rachycentron canadum) and European sea bass (Dicentrarchus labrax)[76,77]. Moreover, in combination with corn gluten meal and meat meal or corn gluten meal and poultry by product meal, the level of SBM in feed can be increased to 50 - 60% and 70 - 90% in juvenile and yearling red sea bream respectively[78,79]. The discrepancies among findings regarding the incorporation of SBM as an alternative protein source for fish may be due to differences in the quality and treatment of SBM, diet formulation, fish size and culture system, or species-specific responses. In the present study, it is likely that ANFs restricted the absorption of essential AA substances in SBM-containing diets, resulting in suppressed growth when YTK were fed high SBM diets. Reduced ADC of protein was observed in diets containing 75% SBM compared with all other experimental diets. A negative linear relationship between increasing SBM levels and ADC of nutrients has been reported for similar species; however, the protein ADC values obtained in the present study were higher than those previously reported, which, as mentioned previously, may be related to the presence of ANFs, as mentioned previously. In contrast, several studies have observed similar protein contents for fish fed various proportions of SBM[80,81]. Also, with respect to fillet composition, fish fed with diets containing high SBM levels had significantly lower protein content, probably due to the poor growth performance associated with these diets. In summary, the present study demonstrates that Se supplementation promotes improved growth, feed utilisation, antioxidant activity and histological performance in juvenile YTK when SBM proteinsare included in the diets. These findings may assist the formulation of cost-effective, ecologically-friendly practical diets for YTK. Further work is required to determine whether increased Se supplementation and/or inclusion of more refined plant-derived proteins can improve the substitution level of PP ingredients in fish diets. We would like to thank Challenger Institute of Technology (Aquaculture) and Department of Agriculture and Food Western Australia for technical and laboratory assistance. We also extend appreciation to Sulaeman, Curtin University student for his assistance during the final sampling. The work was supported by grants from the Curtin University’s Department of Environment and Agriculture (F-134700-2010) and the Australia Awards Scholarship (JAK001360). 1. Day, O., Howell, B. Nutritional demands of farmed marine fish. (1997) Nutr Food Sci 97(5): 188-191. 2. Venou, B., Alexis, M.N., Fountoulaki, E., et al. Effects of extrusion and inclusion level of soybean meal on diet digestibility, performance and nutrient utilization of gilthead sea bream (Sparus aurata). (2006) Aquaculture 261(1): 343-356. 3. Collins, S.A, Desai, A.R., Mansfield, G.S., et al. The effect of increasing inclusion rates of soybean, pea and canola meals and their protein concentrates on the growth of rainbow trout: Concepts in diet formulation and experimental design for ingredient evaluation. (2012) Aquaculture 344–349: 90-99. 4. Gallagher, M.L. The use of soybean meal as a replacement for fish meal in diets for hybrid striped bass (Morone saxatilis×M. chrysops). (1994) Aquaculture 126(1–2): 119-127. 5. Glencross, B., Evans, D., Dods, K., et al. Evaluation of the digestible value of lupin and soybean protein concentrates and isolates when fed to rainbow trout, Oncorhynchus mykiss, using either stripping or settlement faecal collection methods. (2005) Aquaculture 245(1–4): 211-220. 6. Hernández, M.D., Martínez, F.J, Jover, M., et al. Effects of partial replacement of fish meal by soybean meal in sharpsnout seabream (Diplodus puntazzo) diet. (2007) Aquaculture 263(1–4): 159-167. 7. Kokou, F., Rigos, G., Henry, M., et al. Growth performance, feed utilization and non-specific immune response of gilthead sea bream (Sparus aurata L.) fed graded levels of a bioprocessed soybean meal. (2012) Aquaculture 364–365: 74-81. 8. Olsen, R.E., Hansen, A.C., Rosenlund, G., et al. Total replacement of fish meal with plant proteins in diets for Atlantic cod (Gadus morhua L.) II- Health aspects. (2007) Aquaculture 272(1–4): 612-624. 9. Silva-Carrillo, Y., Hernández, C., Hardy, R.W., et al. The effect of substituting fish meal with soybean meal on growth, feed efficiency, body composition and blood chemistry in juvenile spotted rose snapper Lutjanus guttatus (Steindachner, 1869). (2012) Aquaculture 364–365: 180-185. 10. Suarez, J.A., Tudela, C., Davis, D., et al. Replacement of fish meal by a novel non-GM variety of soybean meal in cobia, Rachycentron canadum: Ingredient nutrient digestibility and growth performance. (2013) Aquaculture 416–417: 328-333. 11. Tibaldi, E., Hakim, Y., Uni, Z., et al. Effects of the partial substitution of dietary fish meal by differently processed soybean meals on growth performance, nutrient digestibility and activity of intestinal brush border enzymes in the European sea bass (Dicentrarchus labrax). (2006) Aquaculture 261(1): 182-193. 12. Vielma, J., Mäkinen, T., Ekholm, P., et al. Influence of dietary soy and phytase levels on performance and body composition of large rainbow trout (Oncorhynchus mykiss) and algal availability of phosphorus load. (2000) Aquaculture 183(3–4): 349-362. 13. Francis, G., Makkar, H.P.S., Becker, K. Antinutritional factors present in plant-derived alternate fish feed ingredients and their effects in fish. (2001) Aquaculture 199(3–4): 197-227. 14. Selle, P.H., Walker, A.R., Bryden, W.L. Total and phytate-phosphorus contents and phytase activity of Australian-sourced feed ingredients for pigs and poultry. (2003) Australian Journal of Experimental Agriculture 43(5): 475-479. 15. Refstie, S., Storebakken, T. Vegetable protein sources for carnivorous fish: potential and challenges. (2001) Recent Adv Anim Nutr Aust 13: 195-203. 16. Harland, B.F., Morris, E.R. Phytate: A good or a bad food component? (1995) Nutr Res. 15(5): 733-754. 17. Kumar, V., Sinha, A.K., Makkar, H.P.S., et al. Phytate and phytase in fish nutrition. (2012) J Anim Physiol Anim Nutr (Berl) 96(3): 335-364. 18. Paripatananont, T., Lovell, R.T. Minerals: Comparative digestibilities of chelated and inorganic trace minerals in channel catfish (Ictalurus punctatus) diets. (1998) Aquaculture 161(1–4): 381. 19. Nakagawa, H., Sato, M., Gatlin, D.M., et al. Dietary supplements for the health and quality of cultured fish. (2007) Wallingford, UK; Cambridge, MA: CABI: 244. 20. Watanabe, T., Kiron, V., Satoh, S. Trace minerals in fish nutrition. (1997) Aquaculture. 151: 185-207. 21. Arthur, J.R., McKenzie, R.C., Beckett, G.J. Selenium in the Immune System. (2003) J Nutr 133(5): 1457S-9S. 22. McKenzie, R.C., Arthur, J.R., Beckett, G.J. Selenium and the regulation of cell signaling, growth, and survival: Molecular and mechanistic mspects. (2002) Antioxid Redox Signal 4(2): 339–351. 23. Thiry, C., Ruttens, A., De Temmerman, L., et al. Current knowledge in species-related bioavailability of selenium in food. (2012) Food Chem 130(4): 767-784. 24. Barciela, J., Herrero, C., García-Martín, S., et al. A brief study of the role of Selenium as antioxidant. (2008) Elec J Env Agricult Food Chem 7(8): 3151-3155. 25. Rider, S.A., Davies, S.J., Jha, A.N., et al. Supra-nutritional dietary intake of selenite and selenium yeast in normal and stressed rainbow trout (Oncorhynchus mykiss): Implications on selenium status and health responses. (2009) Aquaculture 295(3–4): 282-291. 26. Maher, W.A. Characteristics of selenium in marine animals. (1985) Mar Pollut Bull 16(1):33-34. 27. Lall, S.P. 5 - The Minerals. In: John EH, Ronald WH, editors. Fish Nutrition (Third Edition) San Diego (2003) Academic Press: 259-308. 28. Abdel-Tawwab, M., Mousa, M.A.A., Abbass, F.E. Growth performance and physiological response of African catfish, Clarias gariepinus (B.) fed organic selenium prior to the exposure to environmental copper toxicity. (2007) Aquaculture 272(1–4): 335-345. 29. Elia, A.C., Prearo, M., Pacini, N., et al. Effects of selenium diets on growth, accumulation and antioxidant response in juvenile carp. (2011) Ecotoxicol Environ Saf 74(2): 166-173. 30. Gatlin, D.M., Wilson, R.P. Dietary selenium requirement of fingerling channel catfish. (1984) J Nutr 114(3): 627-633. 31. Hilton, J.W., Hodson, P.V., Slinger, S.J. The requirement and toxicity of selenium in rainbow trout (Salmo gairdneri). (1980) J Nutr 110(12): 2527-2535. 32. Lin, Y.H., Shiau, S.Y. Dietary selenium requirements of juvenile grouper, Epinephelus malabaricus. (2005) Aquaculture 250(1–2): 356-363. 33. Pacini, N., Abete, M.C., Dörr, A.J.M., et al. Detoxifying response in juvenile tench fed by selenium diet. (2012) Environ Toxicol Pharmacol 33(1): 46-52. 34. Booth, M.A., Moses, M.D., Allan, G.L. Utilisation of carbohydrate by yellowtail kingfish Seriola lalandi. (2013) Aquaculture 376–379 : 151-161. 35. Bowyer, J.N, Qin, J.G., Smullen, R.P., et al. The use of a soy product in juvenile yellowtail kingfish (Seriola lalandi) feeds at different water temperatures: 1. Solvent extracted soybean meal. (2013) Aquaculture 384–387: 35-45. 36. Buentello, A., Jirsa, D., Barrows, F.T., et al. Minimizing fishmeal use in juvenile California yellowtail, Seriola lalandi, diets using non-GM soybeans selectively bred for aquafeeds. (2015) Aquaculture. 435: 403-411. 37. Le, K.T., Fotedar, R. Dietary selenium requirement of yellowtail kingfish (Seriola lalandi). (2013) Agricult Sci 4: 68-75. 38. Le, K.T., Fotedar, R., Partridge, G.J. Selenium and vitamin E interaction in the nutrition of yellowtail kingfish (Seriola lalandi): physiological and immune responses. (2014) Aquac Nutr 20(3): 303-313. 39. Austreng, E. Digestibility determination in fish using chromic oxide marking and analysis of contents from different segments of the gastrointestinal tract. (1978) Aquaculture 13(3): 265-272. 40. Cho, C.Y., Slinger, S.J., Bayley, H.S. Bioenergetics of salmonid fishes: energy intake, expenditure and productivity. (1982) Comp Biochem Physiol 73(1): 25-41. 41. AOAC. Official methods of analysis of the Association of Official Analytical Chemists. 15 ed. Arlington: (1990) The Association of Official Analytical Chemists p: 1298. 42. Luna, L.G. Manual of histological staining methods of the Armed Forces Institute of Pathology, 3rd Edition. New York: (1968) McGraw-Hill Book Company. 43. Dörr, A.J., Pacini, N., Abete, M.C., et al. Effects of a selenium-enriched diet on antioxidant response in adult crayfish (Procambarus clarkii). (2008) Chemosphere. 73(7): 1090-1095. 44. Le, K.T., Fotedar, R. Bioavailability of selenium from different dietary sources in yellowtail kingfish (Seriola lalandi). (2014)Aquaculture 420–421: 57-62. 45. Han, D., Xie, S., Liu, M., et al. The effects of dietary selenium on growth performances, oxidative stress and tissue selenium concentration of gibel carp (Carassius auratus gibelio). (2011) Aquac Nutr 17(3): e741-e749. 46. Kucukbay, F.Z., Yazlak, H., Karaca, I., et al. The effects of dietary organic or inorganic selenium in rainbow trout (Oncorhynchus mykiss) under crowding conditions. (2009) Aquac Nutr 15(6): 569-576. 47. Wang, Y., Han, J., Li, W., et al. Effect of different selenium source on growth performances, glutathione peroxidase activities, muscle composition and selenium concentration of allogynogenetic crucian carp (Carassius auratusgibelio). (2007) Anim Feed Sci Tech 134(3–4): 243-251. 48. Zhou, X., Wang, Y., Gu, Q., et al. Effects of different dietary selenium sources (selenium nanoparticle and selenomethionine) on growth performance, muscle composition and glutathione peroxidase enzyme activity of crucian carp (Carassius auratus gibelio). (2009) Aquaculture 291(1–2): 78-81. 49. Webster, C.D., Lim, C.E. Nutrient Requirements and Feeding of Finfish for Aquaculture. (2002) Webster CDL, C.E., editor, Oxon: CABI Publishing. 50. Cotter, P.A., Craig, S.R., McLean, E. Hyperaccumulation of selenium in hybrid striped bass: a functional food for aquaculture? (2008) Aquac Nutr 14(3): 215-222. 51. Hamilton, S.J. Review of selenium toxicity in the aquatic food chain. (2004) Sci Total Environ 326(1–3): 1-31. 52. Lorentzen, M., Maage, A., Julshamn, K. Effects of dietary selenite or selenomethionine on tissue selenium levels of Atlantic salmon (Salmo salar). (1994) Aquaculture 121(4): 359-367. 53. Wang, C., Lovell, R.T. Organic selenium sources, selenomethionine and selenoyeast, have higher bioavailability than an inorganic selenium source, sodium selenite, in diets for channel catfish (Ictalurus punctatus). (1997) Aquaculture 152(1–4): 223-234. 54. Le, K., Fotedar, R. Dietary selenium requirement of yellowtail kingfish (Seriola lalandi). (2013) Agricult Sci 4(6A): 68-75. 55. Moghadaszadeh, B., Beggs, A.H. Selenoproteins and their impact on human health through diverse physiological pathways. (2006) Physiology 21(5): 307-315. 56. Burk, R.F., Hill, K.E. Regulation of selenoproteins. (1993) Annu Rev Nutr 13: 65-81. 57. Moren, M., Waagbø, R., Hamre, K. Micronutrients. In: Holt GJ, editor. Larval Fish Nutrition. UK (2011) Chicester, West Sussex, Wiley-Blackwell p: 117-49. 58. Brown, K.M., Arthur, J.R. Selenium, selenoproteins and human health: A review. (2001) Public Health Nutr 4(2B): 593-599. 59. Dhur, A., Galan, P., Hercberg, S. Relationship between selenium, immunity and resistance against infection. (1990) Comp Biochem Physiol C 96(2): 271-280. 60. Rotruck, J.T., Pope, A.L., Ganther, H.E., et al. Selenium: biochemical role as a component of glutathione peroxidase. (1973) Sci Total Environ 179(4073): 585-590. 61. Liu, K., Wang, X.J., Ai, Q., et al. Dietary selenium requirement for juvenile cobia, Rachycentron canadum L. (2010) Aquac Res 41(10): e594-e601. 62. Bell, J.G., Cowey, C.B., Adron, J.W., et al. Some effects of selenium deficiency on enzyme activities and indices of tissue peroxidation in Atlantic salmon parr (Salmo salar). (1987) Aquaculture 65(1): 43-54. 63. Gatlin, D.M., Poe, W.E., Wilson, R.P. Effects of singular and combined dietary deficiencies of selenium and vitamin E on fingerling channel catfish (Ictalurus punctatus). (1986) J Nutr. 116(6): 1061-1067. 64. Wise, D.J, Tomasso, J.R, Gatlin, D.M, et al. Effects of dietary selenium and vitamin E on red blood cell peroxidation, glutathione peroxidase activity, and macrophage superoxide anion production in channel catfish. (1993) J Aquat Anim Health 5(3): 177-182. 65. Connelly, P. Nutritional advantages and disadvantages of dietary phytates: Part 1. (2011) J Aust Tradit-Med Soc 17(1): 21-24. 66. Hossain, M.A., Jauncey, K. editors. The effects of varying dietary phytic acid, calcium and magnesium levels on the nutrition of common carp, Cyprinus carpio. (1993) The 4th International Symposium on Fish Nutrition and Feeding; Biarritz, France. 67. Papatryphon, E., Howell, R.A, Soares, J.H.J. 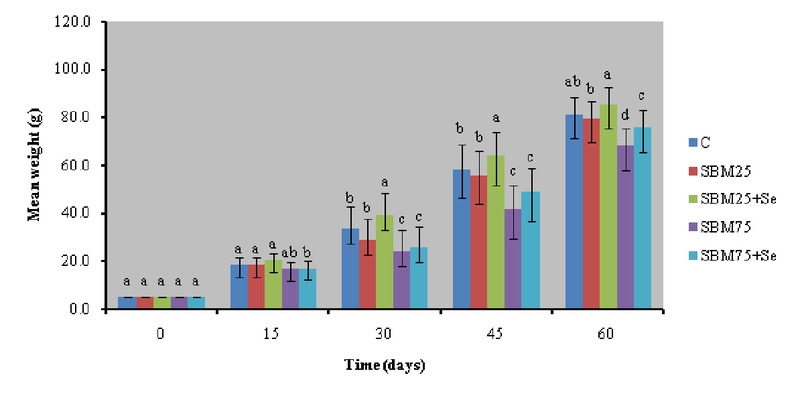 Growth and mineral absorption by striped bass Morone saxatilis fed a plant feedstuff based diet supplemented with phytase. (1999) J World Aquacult Soc 30(2): 161-173. 68. de, Almeida, E.A., Miyamoto, S., Bainy, A.C.D, et al. Protective effect of phospholipid hydroperoxide glutathione peroxidase (PHGPx) against lipid peroxidation in mussels Perna perna exposed to different metals. (2004) Mar Pollut Bull 49(5–6): 386-392. 69. Yajima, D., Motani, H., Hayakawa, M., et al. The relationship between cell membrane damage and lipid peroxidation under the condition of hypoxia-reoxygenation: analysis of the mechanism using antioxidants and electron transport inhibitors. (2009) Cell Biochem Funct 27: 338-43. 70. Poston, H.A., Combs, G.F., Leibovitz, L. Vitamin E and selenium interrelations in the diet of Atlantic salmon (Salmo salar): gross, histological and biochemical signs. (1976) J Nutr 106(7): 892-904. 71. Wang, K.Y., Peng, C.Z., Huang, J.L., et al. The pathology of selenium deficiency in Cyprinus carpio L. (2013) J Fish Dis 36(7): 609-615. 72. Bowyer, J.N., Qin, J.G., Smullen, R.P., et al. The use of a soy product in juvenile yellowtail kingfish (Seriola lalandi) feeds at different water temperatures: 2. Soy protein concentrate. (2013) Aquaculture 410–411: 1-10. 73. Tomas, A., Garcia-Gomez, A., Perez, L., et al. Utilization of soybean meal as an alternative protein source in the Mediterranean yellowtail, Seriola dumerili. (2005) Aquac Nutr 11(5): 333-340. 74. Robaina, L., Izquierdo, M.S., Moyano, F.J., et al. Soybean and lupin seed meals as protein sources in diets for gilthead seabream (Sparus aurata): nutritional and histological implications. (1995) Aquaculture 130(2–3): 219-233. 75. Zhou, Q.C., Mai, K.S., Tan, B.P., et al. Partial replacement of fishmeal by soybean meal in diets for juvenile cobia (Rachycentron canadum). (2005) Aquac Nutr 11(3): 175-182. 76. Dias, J., Gomes, E.F., Kaushik, S.J. Improvement of feed intake through supplementation with an attractant mix in European seabass fed plant-protein rich diets. (1997) Aquat Living Resour 10(6): 385-389. 77. Lanari, D., D’Agaro, E. Alternative plant protein sources in sea bass diets. (2005) Italian Journal of Animal Science 4: 365-374. 78. Aoki, H., Furuichi, M., Viyakarn, V., et al. Feed protein ingredients for red sea bream. (1998) Suisanzoshoku 46: 121-127. 79. Takagi, S., Shimeno, S., Hosokawa, H., et al. Replacement of fish meal by combined inclusion of alternative protein sources in a diet for yearling red sea bream, Pagrus major. (2000) Suisanzoshoku 48(3): 545-552. 80. Viyakarn, V., Watanabe, T., Aoki, H., et al. Use of soybean meal as a substitute for fish meal in a newly developed soft-dry pellet for yellowtail. (1992) Nihon Suisan Gakk 58(10): 1991-2000. 81. Watanabe, T., Viyakarn, V., Kimura, H., et al. Utilization of soybean meal as a protein source in a newly developed soft-dry pellet for yellowtail. (1992) Nippon Suisan Gakk 58(9): 1761-1773.